Want to backup data from iPhone/iPad/iPod to computer? Want to import files from computer to your device? Want to have full control over the data saved on your iDevice? 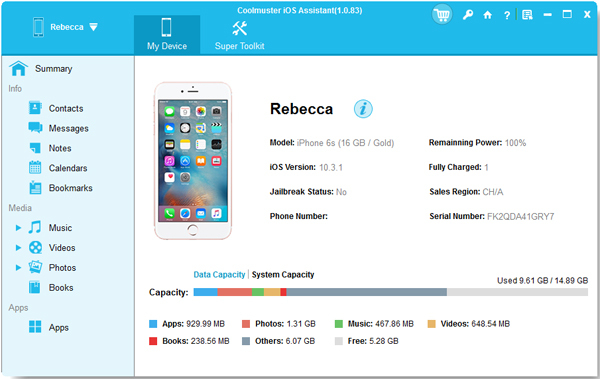 This professional Coolmuster iOS Assistant integrates all these features in one and is surely the best data manager for your iOS device. – No matter which way you would choose, you can always effortlessly transfer everything saved on your device to the wanted service in a fast and safe way. – Effortlessly import any files like contacts, calendars, bookmarks and many more from the computer to your iPhone/iPad/iPod devices. – Export contacts to computer as different formats like CSV, VCF and XML. You can also modify or edit detailed information without any difficulty. – Serving as a media manager, just feel free to manage your playlists, update your music list, customize your unique ringtones and modify all your media files. – Compatible with almost all iDevices on the market.